Should We Give Students The Ability To Grade Their Teachers? The topic of teachers grading students is a universal idea, that's how it is supposed to be. But what happens when students are given the opportunity to grade their teachers? Students are the ones in the classroom with their teachers every day so they know how they act as educational providers. The judgment placed on the teachers may push them to follow to what they are supposed to do and it may help them to strive harder to find the best, most effective ways to teach. Although, these are great reasons as to why students should but there is also many reasons as to why they shouldn’t. Students want to grade teachers because teachers grade students but it is not necessarily the same kind of grading; teachers grade students based on knowledge and effort. If students were to grade teachers it is susceptible to becoming extremely biased. Many students are also very immature, turning the serious matter that could cost the teachers their jobs into a game. This could turn into a personal lash out to the teachers. Teachers grade students all the time but should students grade the teachers as well? Everyday in the classroom students spend their time watching their teachers, learning from them. They get the first hand look at the teacher's teaching abilities, making them key eyewitnesses as to whether the teachers are doing their jobs or not; so doesn't this mean that they should be able to speak up about how they are performing? Sophomore Kaneen Muldrow states, “ Students are the ones receiving the education and if they don't like the education or they're not learning then that’s a problem.” In today's educational system, on occasion administrators will walk into the teachers classrooms to make sure that they are doing their jobs. This does not necessarily mean that the teachers perform great all of the time, especially if the teachers are aware of the visit. If the administrations check-up is preplanned, it is more likely for the teacher to change their bad habits for that specific day to ensure they get graded sufficiently. Students are the ones that get to observe the teacher's behavior daily, so in theory that makes them just right for the task of grading them. The teachers being aware of the student’s ability to grade them might also help pressure them into a set of higher standards to improve their performance. A teacher's performance is always improved the day of an administrative check-up because they know that they are being judged, so in theory if they are being judged everyday by their students, their performance will always be at its best. This could help dramatically improve teaching staff and their level of professionalism. Teachers are allowed to grade students everyday but this does not necessarily make it fair for students to grade teachers. A teacher grades a student based on effort, completion of work, and knowledge of the material being taught. Of course there is ways that this may become biased but most teachers are not biased at all. Teachers are adults and they have a responsibility in their job to make sure that the student learns the information that they are given and grade them based on that. If students were to grade students it would be based on the grade that they receive just so they could blame someone for their incompetence. 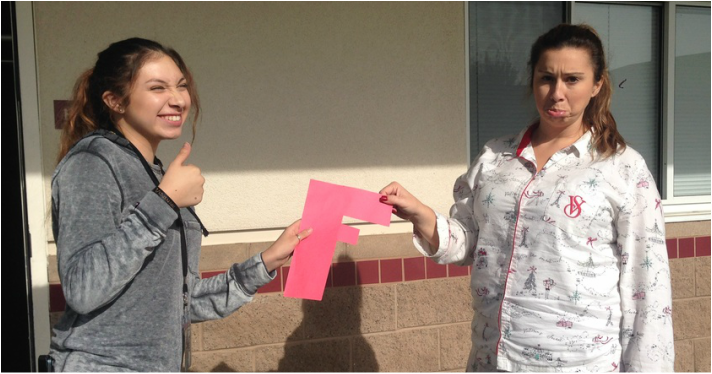 Sophomore Jadenlyn Rocha stated, “If students graded their teachers it would very biased because they would either hate the teacher and give them a bad grade or love them and give them a good grade disregarding their actual teaching ability.” Students are immature and are unable to grade based of of legitimate reasons. English teacher Linda McNeil states,”I see it becoming a way for students to take a personal hit at teachers.” This statement is coming from a teacher's perspective showing the public how it can become extremely unfair. The idea of students having the freedom to grade their teachers may seem amazing in theory but in reality is it really the right thing? Immaturity, revenge, and just disrespect all are factors as to why students shouldn’t grade their teachers. The conflicting side is that students see everything that the teachers do on a daily basis making them witnesses. Will there ever be a way to separate personal hits from actual problems?